Pro-Ject released the Phono Box ultra 500. Pro-Ject Audio unveiled their new Anniversary-Edition Phono Box ultra 500. The "500" in the name as well as the general availability, worldwide limited to 500 pieces, celebrate the 500,000th Phono Box that Pro-Ject shipped in early 2018. According to the press release, the company took this milestone as an occasion to create a one-of-a-kind device, since Phono Box ultra 500 is like no other phono preamplifier in its market segment. The polished chrome surface outshines every competitor in this price range and offers undeniable aesthetics. Underneath this surface, Pro-Ject have used a copper body, which is known to have high qualities in protecting against high frequency interference. The circuit is a fully discrete, OpAmp-less design, featuring polystyrene capacitors, known among audiophiles as the holy grail for phono preamplifiers. The split RIAA equalization network enables a pin-point accurate representation of the RIAA curve, a luxury many other phono preamps do not possess, the company says. The ultra 500 is capable to interface with both MM and MC cartridges, offers a 6-step gain level selector, as well as impedance (10 Ohm-47k Ohm in 4 steps) and capacitance (10/220pF) adjustment. A subsonic filter is, also, included, offering 18dB of attenuation at 20Hz. Signal-to-Noise ratio is -89dBV (for MM), and RIAA accuracy is <0.4dB (20Hz-20kHz). 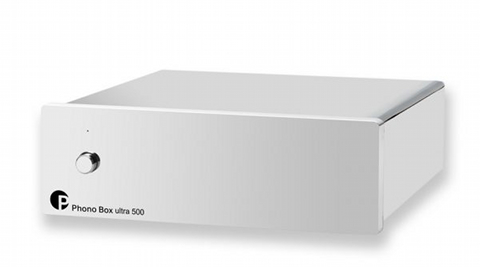 The Phono Box ultra 500 is available worldwide as a limited edition of 500 pieces for €349,- MSRP.